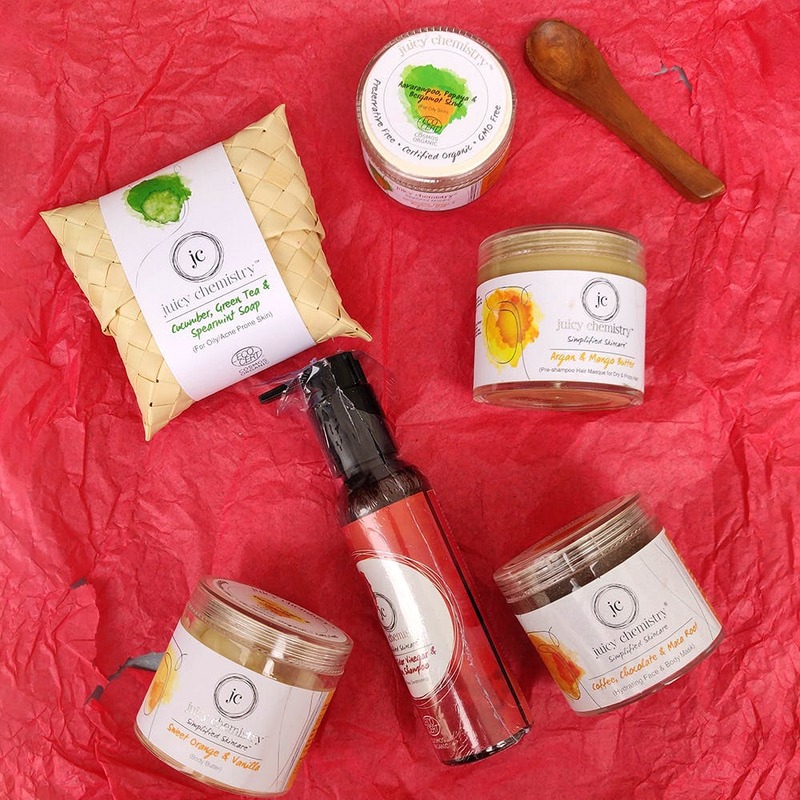 Juicy Chemistry does organic skincare that's completely preservative-free and fresh. If you're looking to switch out your hyper-chemicalled skincare basics for earthier, all-natural variants, this brand will be your Mecca. That they've got all sorts of goodies that are so fresh and preservative free, they feel like they're coming straight out of the earth. From the rustic, fuss-free packaging to the no-frills texture of their products, it's clear chemicals were not invited to this party. You'll find a range of skincare, bath and bodycare products on this website; cleansers toners, moisturisers, serums, body butters, face packs, soaps, scrubs, body oils, bath salts, shampoos, hair masks... the list legitimately goes for a bit. Of their vast expanse of products, I tried a gourmet soap (Cucumber, Green Tea and Spearmint, to be precise), the Organic Argan and Mango Butter Hair Mask, Sweet Orange and Vanilla Bean Body Butter, Coffee, Chocolate and Maca Root Face Mask, and their Apple Cider Vinegar and Argan Shampoo. Of these, the cucumber soap (which left me feeling fresh as a spring flower, although it's mid-winter), the body butter (which has a texture like Amul Butter, smells like a dream and really hydrates your skin), and hair mask (that honestly showed results after two weeks of regular use) were my favourites. Overall, their products are for a careful, beauty consumer who's as particular about what they put on their body as they are of what they put into it. I'm actually not that person, but I still loved them. Honestly, not much, but many of their products quickly expire due to their preservative-free freshness. It's completely understandable, just like, 'hey, the pressure is on'.